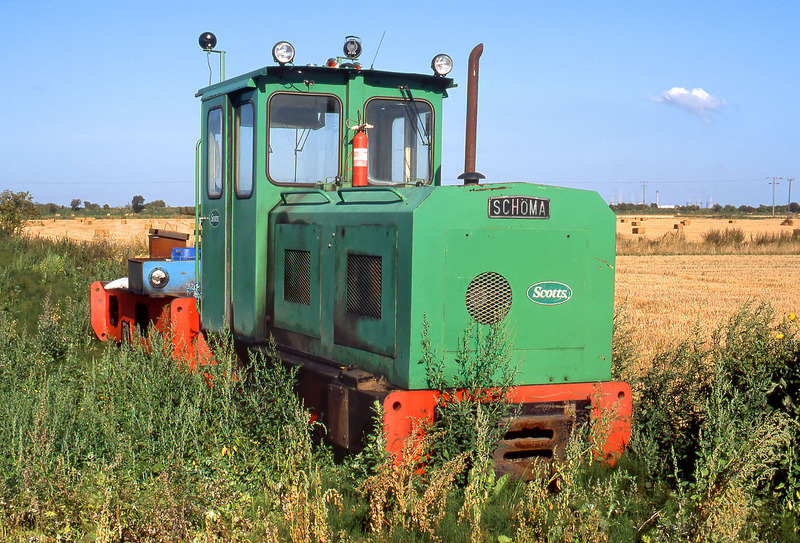 Schöma 0-4-0 86hp 5129 and its slave unit stand amid the weeds near Red House Farm, Swinefleet on 1 September 2002, shortly after the 3 ft gauge peat railway ceased operations. This view is looking towards Goole, and Drax Power Station can clearly be seen on the horizon. This loco was one of a pair that were used on the line its later years, and they were considerably more powerful than anything used previously. The lines stretched for miles onto Goole and Swinefleet Moors, with both permanent and semi-permanent sections of track laid to reach the various peat cutting areas. The site, which had been operated by Fisons, Levingtons, and finally Scotts, has now been taken over by English Nature.